The magnolia and tulip tree both belong to the Magnolia family. Both are hardwoods that bloom in spring. Both prefer moist, rich soil and partial shade. There are, however, several distinct differences between the two. 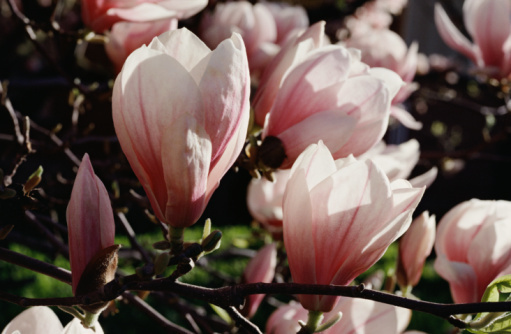 Both magnolia and tulip trees belong to the Magnolia family. The southern magnolia, Magnolia grandiflora, is native to the southeastern region of North America. 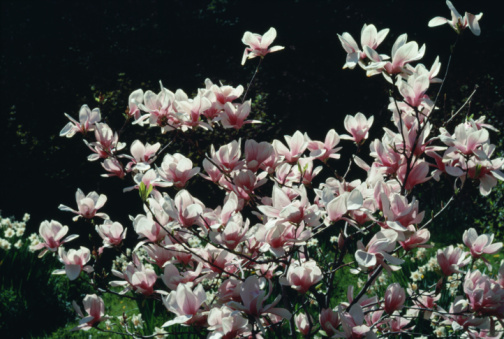 A relation, sweetbay magnolia, is hardy as far north as New York and New Jersey, though most magnolias grow in the U.S. Department of Agriculture's Plant Hardiness Zones 6 to 9. The tulip tree, or Liriodendron tulipifera, was brought to Virginia by European settlers. It is hardy from Quebec to Texas and Florida. Magnolia grandiflora grows 20 to 50 feet tall while its cousin, Liriodendron tulipifera, can grow up to 150 feet in height. Southern magnolias are evergreen trees and tulip trees are deciduous – they drop their leaves each fall. The African tulip tree reaches 80 feet in height but grows only in Zones 10 and 11. Both trees flower during spring in the southern climates and summer in the northern parts of their ranges. Magnolia grandiflora grows large white flowers; some species can have pink highlights. The tulip tree's flowers, yellow with bright orange bands, grow in the upper part of the tree's crown. Do Magnolia Trees Lose Their Leaves?